Blue Lunch. Above the Fold. 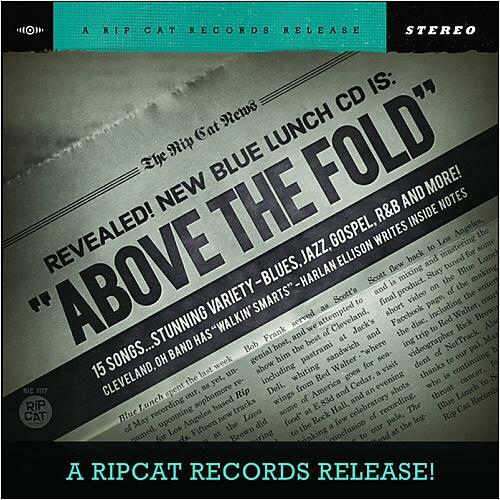 Blue Lunch is a Cleveland based octet of skilled musicians well into their third decade as a band. If the reader has not heard of them, the most likely reason is a result of being pigeonholed in the quagmire known as “genre”. In the case of Blue Lunch, you’ll find them listed under “Blues”. Ignore them at your own risk. Blue Lunch expertly delivers the blues. However, Above the Fold takes the listener on a serpentine ride across borders that often surprise and mostly succeed. 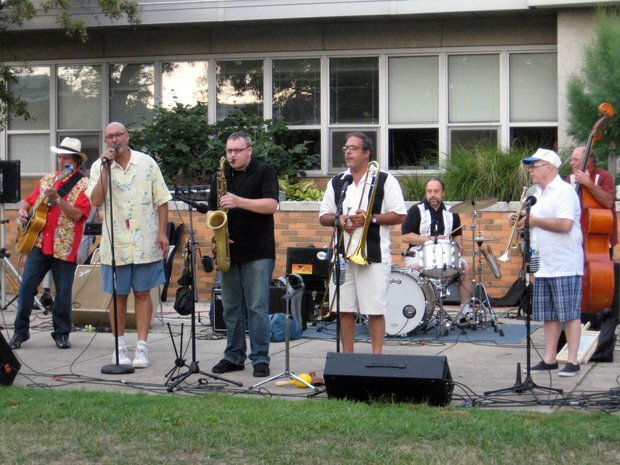 Though Blue Lunch may be classified as a "blues band", they are equally adept at jazz, funk, gospel, and swing. And they may jump from one category to the next and the back on the same track. Bob Frank is credited as the composer on seven of the 15 songs on this CD. He is one of those guitarists blessed with the ability to front the band when called upon, and the generosity to step back and support the ensemble. His playing versatility is likely his strongest suit. As an example, on his composition The Long Game, an up-tempo blues serves as bookends for a shift mid song into funk and back again. If Mr. Frank has one weakness it is his erratic vocals. On “Woman I Bleed,” and the others written by Frank, there are hints Frank has the ability to vocalize. However, he tends to vacillate between spoken word and singing. It starts to leave one wondering if that is the band’s greatest limitation. However, that suspicion is dispelled the final track, “Good News.” This traditional gospel piece is sung acapella by a quartet of the band’s members and proves back-up vocalists are there for the taking. “One Fine Day” is a very fine instrumental composed and arranged by saxophonist Chris Burge. Add Mike Rubin on trumpet and Bob Michael on trombone and this brass section will take you back to the days of Blood, Sweat, and Tears and Chicago Transit Authority. They are just that good. 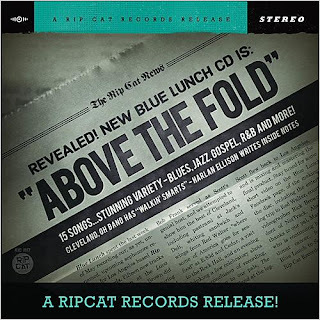 Throw in some well-played harp fills by Peter London and Blue Lunch owns this piece. The band is grounded by its rhythm section of Scott Flowers on drums and Ray Deforest on upright and electric bass. Some slight adjustments on the EQ helps bring their talents as well as keyboard man Mike Sands. Tweak that EQ a tad more and guest Sammy DeLeone’s congas pop into the mix. There is such a thing as a small-big band. Above the Fold provides ample opportunity for every member to solo. It is the entirety of Blue Lunch’s repertoire that should push Northeastern Ohioans to seek them out. Performers: Bob Frank (guitar, vocals), Peter London (vocals, harmonica),Chris Burge (saxophones, harmony vocals), Mike Rubin (trumpet), Bob Michael (trombone, harmony vocals), Mike Sands (piano), Ray DeForest (bass violin, bass guitar, bass vocals), Scott Flowers (drums). Guests: Evelyn Wright (vocals on Track 8), Tim Longfellow (Hammond organ on Tracks 5 & 8), Sammy DeLeone (congas on Tracks 2 & 8). Tracks: Ain’t Trying to Kill Nobody, One Fine Day, The Long Game, Everybody’s On the Phone, Woman I Bleed, No Time Like the Present, Seven Times, Where Do You Think It’s Going, Lake Erie Highball, Venita, Love No More, All I Needed, Tossin’ and Turnin’ and Burnin’ All Up Inside, Katt’n Around with Moe, Good News.